You can apply together with your spouse, dependent children under the age of 25 and dependent parent above the age of 65. This way the whole family can enjoy the benefits of Vanuatuan citizenship. Your application starts with sending to your agent your current, valid passport copy, together with a no-criminal record. When your background is cleared, the program costs for all applicants is calculated, and you sign the citizenship application papers. You will be required to make a deposit of 30% of the total cost in advance. This is non-refundable. Once you make the payment, it takes 30-60 days to process your application. When your application is approved, you pay the remaining 70% of the program fee, upon which you receive citizenship and a Vanuatuan passport. You will be asked to make at least one trip to Vanuatu to make the oath of Allegiance. Your Vanuatuan passport will be valid for 5 years, and can be renewed without an additional investment. Vanuatu allows dual citizenship, this way you can retain your own passport while also getting a Vanuatuan passport. With the latter, you can travel without a visa to the United Kingdom, the Schengen zone, Russia, and several Asian countries. This includes a 6-month visa-free stay in the UK and 1-3 month of visa-free stay in various Asian countries such as Malaysia and Singapore. A single USD 200,000 donation to the Vanuatu Development Support Program makes you eligible for Vanuatu citizenship. This is a onetime cost that covers the whole procedure if you apply alone, and which gives you lifetime citizenship. If you wish to bring along your family members, additional fees apply. For a family of four (your spouse, and 2 children): USD 35,000. 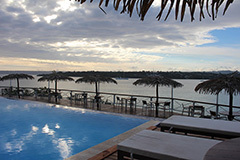 Vanuatu offers excellent tax residency conditions: There is no income tax, estate taxes or gains tax.